With Fall approaching, one of Texas’ most beautiful trees, the Texas Madrone reaches the height of its beauty as it puts forth its crop of beautiful red berries, often growing in hand-sized bunches and completely covering the tree. 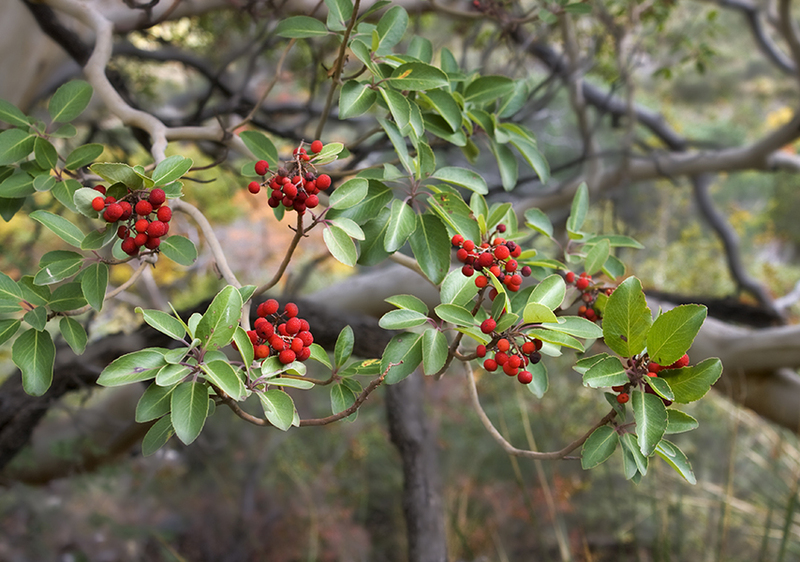 These lovely berries give the tree it’s first scientific name, “Arbutus,” which is a Latin word meaning “Strawberry Tree.” The name Madrone comes from the Spanish word madroño which means the same thing. In the winter, the combination of green, white, and red wood, bright green leaves, and large red berries makes this tree a joy to behold. 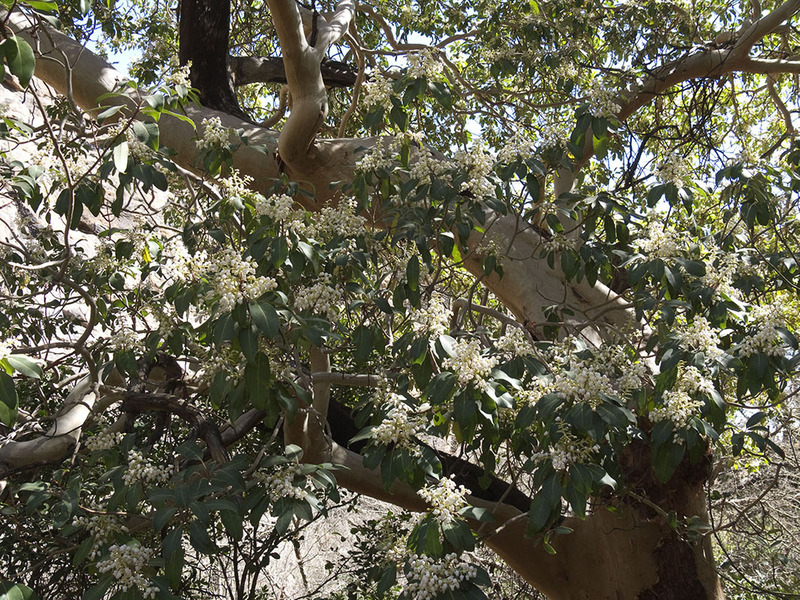 In the spring, the tree is covered with large bunches of urn-shaped, cream-colored flowers which fill the air with an exquisite fragrance. Small groups and individual trees can be found in many places. For West Texans, the best place to see them is in the Chisos Mountains and the Guadalupe Mountains. You can see many Madrones along the road to the Basin, but without doubt, the best place to find them is in the Guadalupe’s. There are surviving Madrones on the trail leading almost due north from the Pine Springs campground. These Madrones are atypical in that they grow mostly in isolation, giving this trail a distinctly “savannah” look and feel. The Devil’s Den trail passes through stands of this tree, and is a beautiful visit any time of the year. But the very “best of the best” location is McKitrick Canyon. In the shelter of this canyon, starting in early fall, the Maples begin to change color and Madrones line the trail with their fruit-laden branches. A fall hike through this canyon is an experience you will never forget. Trust me on this. 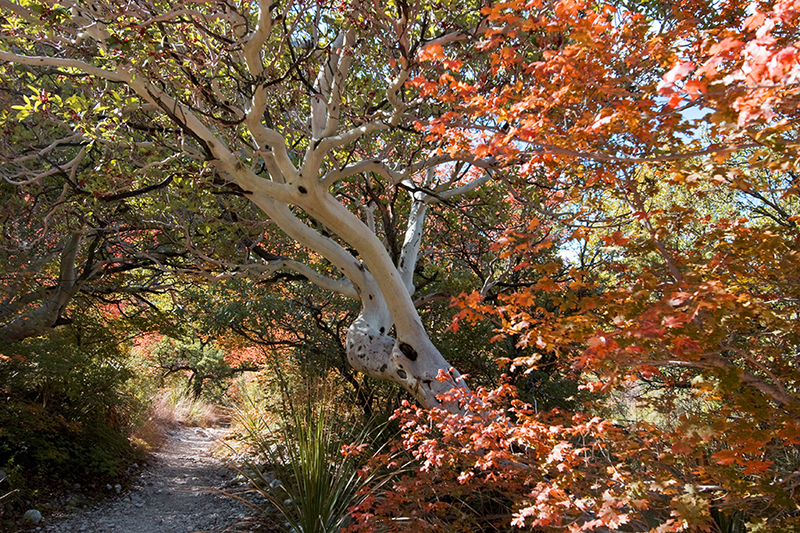 The Texas Madrone is not normally a large tree – it reaches 20 to 30 feet at the most. 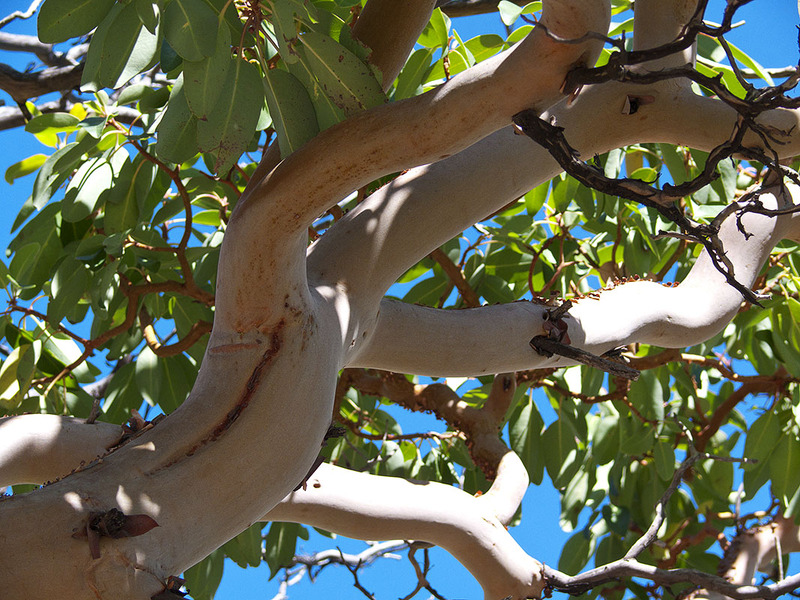 Madrones are usually multi-trunked with tortuously-shaped limbs that are smooth to the touch. The limbs spread out to give the tree a canopy of dark, leathery leaves that stay green year round. 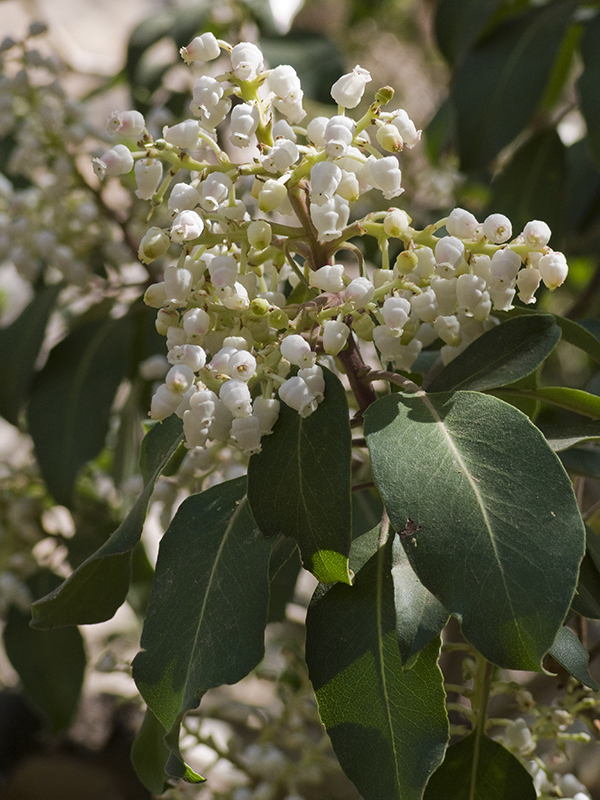 In the spring to mid-summer blooming season, the tree produces large clusters of creamy white, bell-shaped blossoms that fill the area with a delicious fragrance. The velvety-smooth wood changes appearance throughout the year. In the spring it usually runs from white to a pale green though it may sometimes be a light burgundy. As the year progresses, the old bark darkens into shades of brown and red and begins to peel off. As it falls away, it reveals the younger wood underneath which may be any color between white and bright red. In fall, the tree puts out its crop of berries. In the winter, the combination of green, white, and red wood, bright green leaves, and large red berries makes this tree a joy to behold. 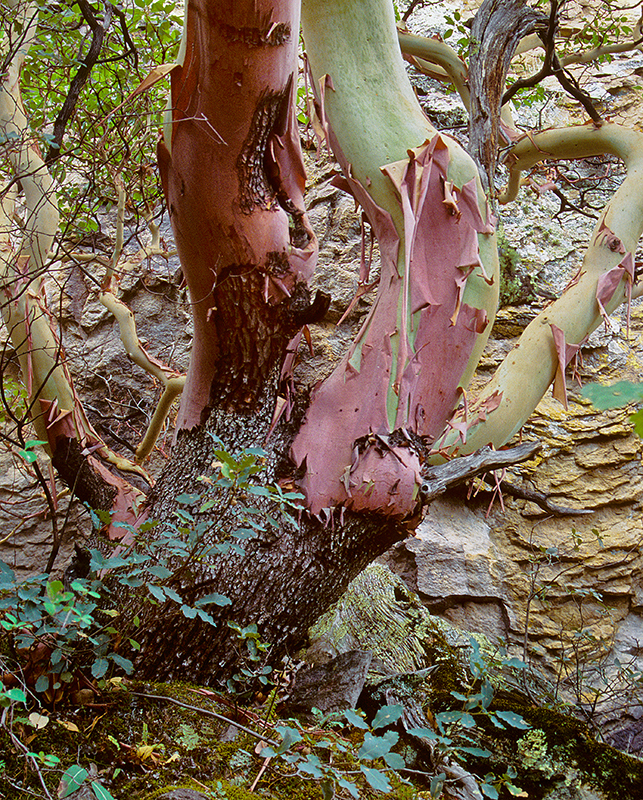 Despite the Madrone’s great beauty, it is seldom seen by the general public. There are several reasons for this. The Madrone is a fairly rare tree in North America, growing only on the Edwards Plateau, in far West Texas, and in southeastern New Mexico. Its’ preference for montane habitats keeps it out of the view of the general public though hikers and backpackers are usually familiar with it. It is not very good at reproduction. The seedlings are palatable to deer so few seedlings survive to grow to maturity. It is extremely slow growing – it can take over a century for a Madrone to fully attain an adult height of 20 to 30 feet. These factors, combined with declining habitat, rising temperatures, and decreasing rainfall are causing Madrone populations to decline. It is fortunate that this tree is little used for utilitarian purposes. Native Americans considered the tree sacred and refused to burn it despite the excellent fire it provides. The wood is reddish-brown, hard, heavy, and close-grained. It is dimensionally stable, easily worked and it takes a fine polish; however, it is brittle and not very durable. 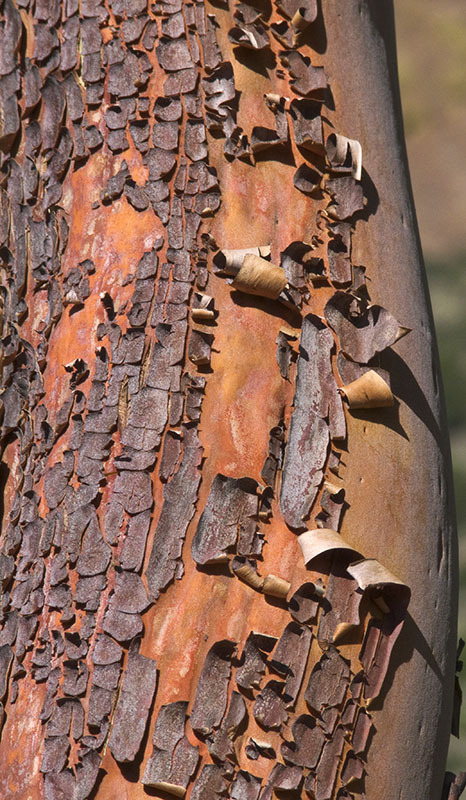 In most of its historical applications, Madrone wood has been replaced by cheaper synthetic materials. Madrones are more plentiful in Mexico than here, and they are used somewhat more. Leaves and bark are used as astringents and diuretics, bark and roots are used to make organic dyes, and the wood is sometimes used to make stirrups. The berries are used most. Birds such as trogons, jays, and band-tailed pigeons eat them – Black Bears are quite fond of them. If you hike in the Chisos you will see many madrones that carry deep scratch marks from the claws of bears climbing to get the fruit. Though the fruit tastes rather bland to modern palettes, it can be made into jellies and jams. The Tarahumara Indians of northern Mexico make an alcoholic beverage from fermented Madrone berries and flavor tortillas with the tree’s flowers. One would think that any tree this beautiful would be avidly cultivated, but that is not the case. Texas Madrones are notoriously difficult to plant and grow. Twenty years ago it was widely believed that it was impossible to grow one from seed, or to transplant one from the wild. In 1975, the Texas Horticulturalist magazine reported on an experiment that was conducted to try to germinate madrone seeds. Of the 10,000 seeds planted, researchers succeeded in germinating only 2 seeds. In the past 20 to 30 years, growers have gotten better, and today a handful of nurseries, mostly in the Kerrville area, have mastered the business; fair-sized Madrones may now be purchased for home gardens. We now know enough about this tree’s needs that amateur gardeners can reasonably expect to be able to grow them. Should you decide to try, here are a few facts you should keep in mind. Seeds need to be planted shortly after harvesting. If they remain moist, germination can begin within 7 to 14 days. Once dried they rapidly lose fertility. After only 6 months of cold dry storage you can expect fewer than 40% of seeds to be fertile. After 2 years fertility drops to around 4%. Seedlings grow best with a 12-hour photoperiod at daytime temperatures of 81 degrees and nighttime temperatures of 64 degrees. The soil should be well drained and run close to a neutral pH (6.8 to 7.2). Good growth occurs at 60 to 70 percent relative humidity at a light intensity of 6,500 to 10,000 lux. At higher light intensities, growth may be reduced by photo-bleaching of chlorophyll, though high soil moisture may ameliorate this problem. Under ideal conditions you can expect germination rates of from 20% to 90%. Madrones have a poorly developed fine root system and what they have is easily damaged. Worse, even slight damage to the root system is usually fatal to the tree. Growers should take every precaution to avoid root stress – this is not one of those trees you can take home, rip off the plastic bag, fluff up the roots and toss into a nice-sized hole. Rather, bags should be removed with the utmost care, the tree lowered into a hole of exactly the size of the root ball, and additional soil gently sifted over to fill the hole (no tamping please). Home growers may benefit from starting young trees in biodegradable containers that can be lowered into planting position without disturbing the tree’s roots. Much remains to be learned about this fascinating tree, but its best hope for survival probably now lies with home horticulturalists who take the time to learn how to grow it, and who share their knowledge with others – without our help it is unlikely that this tree will continue to do well here in the northern Chihuahuan desert. I love these trees so will take great care with them. I have a bunch I grew from old dried up seeds I found under a madrone in the Austin area. They seem pretty easy to grow if really slow. Only one seedling likes to get direct sunlight- it is the largest. After over a year, it is about 6 inches tall and the rest are about half that size. I have transplanted them several times and they don’t seem to mind, but it does seem to slow their growth for a while. They do seem picky about water. They like to be well drained but watered often and don’t like to have wet feet, but I was surprised at the amount of watering they seem to need. I water them at least twice a week in the summer. It is neat that they already have peeling bark. If you want some, I would just get some old seeds and toss them where you want them and water the seedlings or put them in peat pots until they germinate and transplant. They do not like the peat pots because they dry out so quickly. The Kimball Museum of Art has a ‘grove’ of trees planted at the water shedding between the two galleries and I wonder if the grouping is a variety and/or Mardrones? Wish I could attach a photo but…. I don’t think they’re Madrones, but it’s been a long time since I’ve been there. Madrones are notoriously difficult to plant, get established, and keep alive, particularly in urban/high-traffic environments. There are many bare-trunked plants in Texas. Can you tell me why they are also called a Naked Indian tree? I get the “naked” part referring to the absence of bark, but why Indian? I’ve no idea. But then I’ve never understood why 19th century anglos thought American Indians were red. I just can’t see it. Have one growing in my yard in San Antonio. Transplanted from a tiny plant about 10 years ago. Actually, transplanted two saplings harvested from the Hill Country. Planted them beneath a Live Oak Tree on a little mound in my front yard. Noticed both were suffering terribly and one died; had to figure something out. Since they seemed to thrive under the Junipers, thought it might have something to do with harsh hot sunlight in the afternoons. Built a lean-to with mesh to allow filtered sun through. Allowed full morning sun and covered up for filtered afternoon sun for nearly two years as I had been told they were nearly impossible to transplant. The sapling responded almost immediately. Tree is now 8 feet tall and 5-6 feet wide. It’s my pride and joy. With only one sample in my transplant effort, I don’t know whether it was our afternoon shading or sheer luck that allowed it to survive. Flowers but we’ve never had any fruit. This is a great story. Hopefully other people will try it and have success. I want to grow one in El Paso, and I make it work? Our soil contains a lot of lime. I think the climate and soil would be fine in El Paso. But these plants are extremely difficult to grow. When small, they grow only about a quarter of an inch per year; it is now known that the plant is extremely susceptible to root damage — the slightest disturbance will quickly kill the tree. There are several growers in the Hill Country now who know how to get one started. Good luck with your endeavor. I live in Abilene tx, we went down to Kerrvill area where a man grows them. I bought one from him and have had it about a yr. it’s only about 9 inch high. It’s is still alive with only leave on the top part. I am hoping maybe soon it will take off. I know it take 5 yrs to know if it will survive. 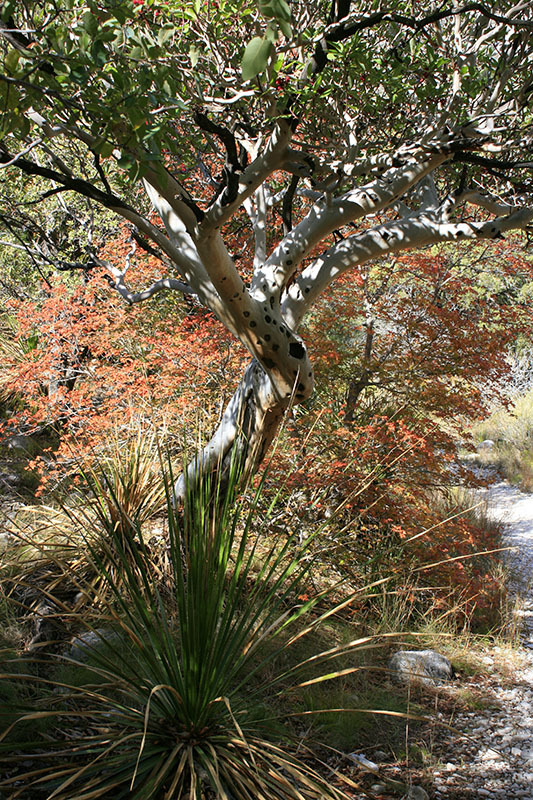 There is a huge Madrone just off the trail to “The Window” in Chisos Mountain Park. Really beautiful (and did I mention….. HUGE). I live south of Abilene, TX. I have seen Madrone trees at Ft. Phantom Hill as well as T&P Lake near Baird. I would love to purchase several to grow on my land. If anyone knows where these beautiful trees are sold, please let me know. i live in Tye . we went down to kerrvill there is a guy there who grows them . i have a baby . its doing ok it out out new leaves . but it only about 12 inch high . they are very hard to grow . i am hoping mine makes it . you dont know for 5 yrs if it will …. my mom got one too she lives south of abilene . ill try to find the link to the guys farm where he growes them . Thank you very much for this information. I´ve been hiking the McKittrick Trail in September and I wondered what tree this might be. Thanks! there is on growing at our local hospital here in abilene tx …… i want one now ! I worked on this tree for a Master of Horticultue Degree. I found the Tree easy to germinate and grow. I wish I had the facilities to grow this tree commercially because it can be done. This is my favorite tree, any wonder why I chose it as my research project. Jeff, I would love to find some grown, but have not been able to find a nursery growing the Madrone tree. If anybody knows who is growing these trees, please reply. Soul Ross State University in Alpine has a few in their greenhouse. We bought one about nine inches tall for $10. I don’t know the number, we stopped by the greenhouse. 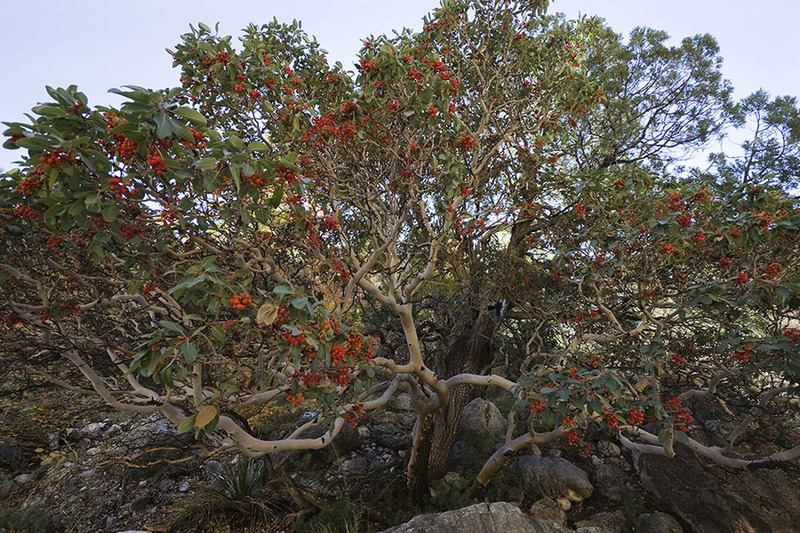 How is this tree related to the Manzanitas you see, for example, in Yosemite? I’m on the opposite side of the Hill Country, in Austin, and there are a few madrones over here, but I rarely encounter one. I appreciate your thorough treatment of the tree. In my blog I’ve been featuring native species that grow over here. My favorite tree! Rich will be the person(s) who can figure out how to grow these in mass quantities and sizes, which are transplantable into general landscapes. But your report on some nurseries’ success is encouraging! 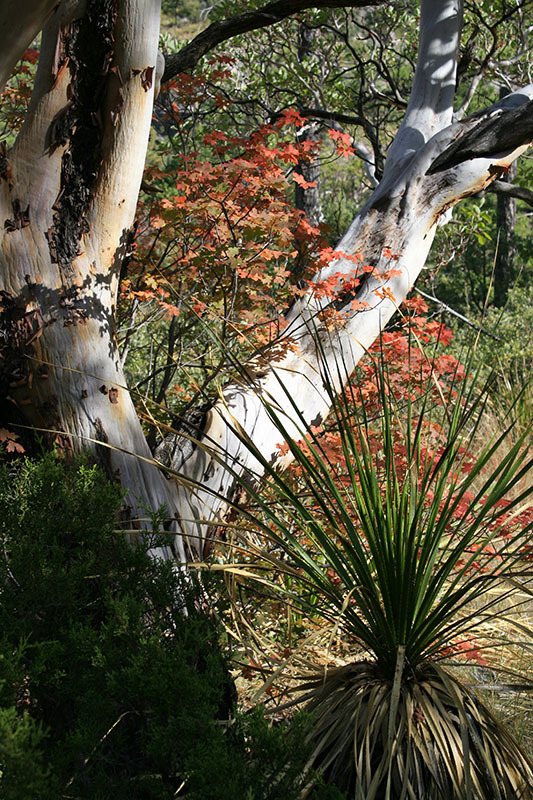 I hope I can do a madrone trip soon – a madrone savanna sounds great!